Dryer fires happen and they happen more often than we are lead to believe. At dryer vent cleaner in the lead up to Christmas we had 3 customers who had dryer fires inside their dryer all because there were issues with there dryer vent and how they were installed. Luckily only 1 of the homes had the fire department come out to tend to the issue. The homeowners were counting their lucky stars that night, as the home owner told us he had planned to run the dryer and go out to his kids sport activity but for some reason put it off. Not long after running his dryer he witnessed smoke coming from the back of the dryer, called 911 and was able to turn off the dryer before they arrived. They determined the dryer fire had stopped but that they should get someone in to check the dryer vent and inspect inside the dryer. When we got to the house which was next day, the homeowner showed us the dryer and we stripped it down to see what the inside of the dryer was like. We were not too shocked, but the homeowner was speechless realising just how close they were to losing their home had they left it running before leaving. We determined that despite the smell of smoke from the dryer fire the dryer would still work, no wiring was damaged. Dryer Vent on Roof Caused this Dryer Fire! The dryer fire in Oakville shown above was caused by a dryer vent on the roof! Roofers are putting your family at risk by using bathroom vents that prevent the dryer lint from ever escaping! They even state on the actual vent “DO NOT USE THIS MODEL FOR DRYER VENTING” the manufacturer Canplas/ Duoflo of this roof vent has 2 styles one that can be used (albeit we do not recommend them they are still bad!) and one that cannot. Roofers do not understand the danger they are inflicting on families of roof vented dryers. After 2 years of a new roof or a replacement roof we get calls for dryer issues. We actually modify these shoddy roof vents to at least allow lint to escape and recommend cleaning every 2 years. 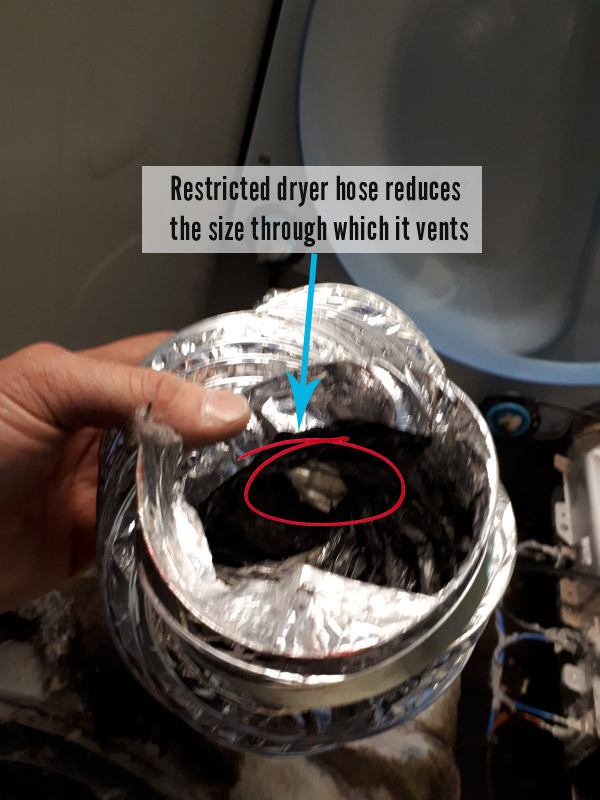 Because of these badly designed dryer roof vents lint cannot get out so it accumulates in the dryer vent and then starts to settle inside the dryer cabinet, resting on the motor, blower, all over the bottom and on the heating element. It is just a matter of time before a dryer fire happens. We cleaned out the dryer vent, cleaned the dryer out, modified the hose at the back, removing the flex hose that should not be used! And we modified the dryer roof vent so it works better than when first installed. We had a call to a homeowner in an Adult Living Community in Hamilton because her dryer was taking forever to dry her clothes and her friend had recommended us! 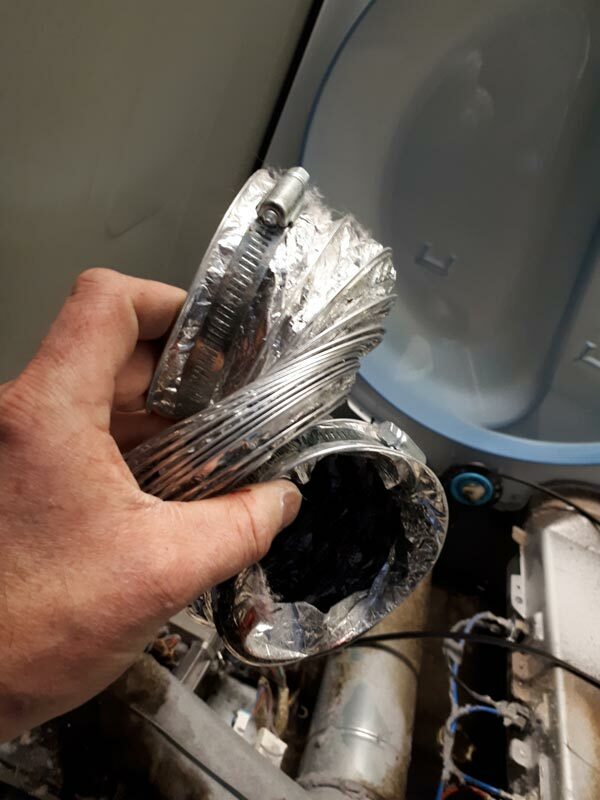 Upon initial inspection the dryer vent should never have needed cleaning, because it was only a 12″ route to the outside but the dryer vent on the wall and the dryers exhaust on the back of the dryer were not in line so flex hose was used. The other problem was the dryer was in a closet with very little room to connect the hose without it getting crushed. The company that installed the dryer did not care, they installed the dryer and left it with the hose crushed. We tested the dryer with our analysis tools and determined no airflow, confirmed when we looked outside. We were able to adjust the dryer vent through the wall and fit a solid, crush proof piece of duct work. But we were concerned about the inside of the dryer, when we showed the homeowner she was flabberghasted she had in the past smelled smoke and here was the cause, the dryer was full of burnt lint all because who installed it used the wrong kind of dryer hose and the builder for not putting the hole in the right place when there was so little room to begin with. With the 4″ flex hose (that should not be used!) crushed the actual gap for lint & air to pass through was about 1/2″ only a huge restriction. The dryer is a simple machine and still creates lint despite the restricted vent, this lint then starts to settle inside the dryer can this is how dryer fires occur. 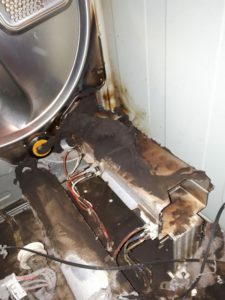 Lint settles or passes over the dryers heating element and gets burnt, this lint can burn out or if big enough can ignite and before you know it a dryer fire. This is not due to old age, the dryer is designed to heat up, turn the drum and pass heat through the clothes and push that damp air out through the vent to the outside. wrong hose on your dryer should not be used! Despite the hardware stores stocking flexible hose that looks like foil this is in fact plastic hose made to look like aluminium. The dryer manufacturers do not recommend it. Dryer transition hose should be able to contain any dryer fire if one happens, so the lint burns out and does not spread. The flex foil will spread any dryer fire through to the surrounding area. Flex hose can also be crushed behind the dryer, 4″ should be maintained connecting the dryer to the wall. Inside the walls and ceilings ONLY solid duct work should be used! If in an attic or un-heated space then the duct needs to be insulated to prevent moisture. Screens prevent lint from escaping, when lint cannot get out it starts to accumulate in the dryer vent line and then settles inside the dryer. 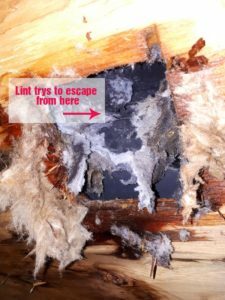 If you are worried about birds, or mice etc then there are better pest proof vent caps that can help or use a wire cage outside the vent cap, giving plenty of space for lint to clear the cap and hopefully wind can clear the lint that settles in the cage. Dryer vent cleaning should be carried out if your dryer is taking a long time to dry. If you have a short run then you can do it yourself, but with longer runs you should consider a dryer vent cleaning company. Is there heat inside the dryer? If there is heat inside the dryer the dryer is doing it’s job. The reason the dryer is taking a long time is more than likely because of issues with the dryer vent. With the dryer running check outside to see if there is any air coming out of the dryer vent cap. With a properly installed and clean dryer vent if you have louvred vent cap the flaps should be almost parallel with the ground. If you open the dryer door do you see lint around the door? Link around the dryer door is a clear sign the dryer vent needs cleaning, this shows that lint is taking too long to escape so may be accumulating inside the dryer cabinet too. Is the dryer cabinet hot to touch? If the dryer is running and very hot to touch, your dryer is over heating due to restricted airflow. If you have flex hose behind the dryer check that it is not crushed, this restricts airflow and will result in lint accumulation as there is not enough oomph to drive the air outside. No heat from the dryer? With no heat the vent can still be the cause of this because a clogged vent can lead to the dryer over heating and the thermal fuse may blow or worse the heating element may burn out.